Apparently, this convenient little bag of spuds saves you cooking time and effort so you can have mashed potatoes any time. All you do is add your own flavor enhancers and it's just like home made. Ingredients: Potatoes, Salt, Disodium Dihydrgen Pyrophosphate (I'm pretty sure that's supposed to be Dihydrogen). I know it's just a little thing, but I'm pretty sure I've never added disodium dihydr(o)gen pyrophosphate to my mashed potatoes. 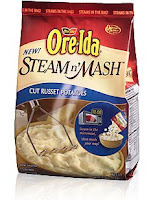 I do not doubt that this product does cut prep time by quite a bit, and I am sure there are many people who don't have the time or inclination to boil up their own potatoes before they mash them. And I would never criticize anyone who chose to use this product; I'm all for shortcuts in the kitchen. So what's my issue with this product? "For real home made, real fast," is what the commercial says. And it's a lie. This method doesn't take that much longer, and doesn't dirty more than one pan (and the serving bowl, if you use one). And they taste really great under braised oxtails. MASHED RED POTATOES WITH BLEU CHEESEMakes 4 servings. In 3-quart saucepan, combine potatoes with salted cold water to cover. Bring to a boil, reduce heat, cover loosely and cook until potatoes are knife-tender, about 15 to 20 minutes. Drain potatoes and place pan back over low heat. Add butter, milk, and cheese. Use a potato masher to combine all of the ingredients, adding more milk or butter to achieve desired consistency. Season to taste with salt and pepper. If you don't want the potato skins, use a food mill to puree the potatoes. I like to leave them in so you can tell that it's a red potato mash. Ha! Awesome! I thought I was the only one who had noticed this commercial and how annoying it is. I hate the form of advertising sells its product by making a very basic action seem impossibly difficult and life-destroying. Those were served to us at the Thanksgiving meal....alful. Had a funny taste. Really, how hard is it to peal some potatoes and throw them into a pot? Yes, misreall. Anyone who has that much trouble peeling a potato doesn't know how to do it. And did you notice how many potatoes she's peeling? It's enough to feed an army. I'm not surprised that they had a funny taste, Bert and Felix. I imagine that's the disodium dihydr(o)gen pyrophosphate you were tasting. It's kind of like the instant mashed potatoes - whatever they are, they sure as hell aren't home-made.